Lil’ Pookie’s unique style is the result of a lifetime of musical influence. Born Jimmy Seraile, he was part of a talented musical family. His grandfather, the late Delton Broussard, was the forefront of Pookie’s roots and was instrumental in his interest in playing the accordion. He began his career in music playing the “frottoir,” (or “rubboard” as known to most outside of southwest Louisiana). He gained experience and exposure through traveling with the popular Zydeco Force. 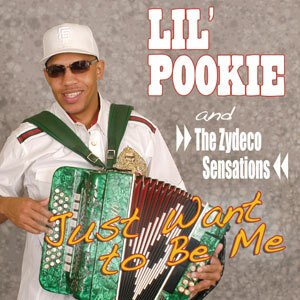 Lil’ Pookie’s musical journey began on the outskirts of the Zydeco Capitol of the World, Opelousas, Louisiana. As a youth, he spent much of his time learning to play music. He watched other musicians and sneaked into local dance clubs to gain knowledge of what was already instilled in him. It wasn’t long before he began playing the same music he craved. At the age of 12 he shocked the Zydeco world by entering and winning the first accordion contest at the popular Zydeco Extravaganza. He began to learn other instruments and became a drummer with the Zydeco Blazers, later moving on to the accordion player for the group. They were soon renamed Lil’ Pookie and the Zydeco Heartbreakers. Eventually Pookie took a break from the Zydeco scene and playing music as a whole. But after some time, Pookie realized that the music in him was still very much alive. Now he’s back better than every as Lil’ Pookie and the Zydeco Sensations with a brand new look, sound, and electrifying magnitude of lyrics that will have you remembering why you fell in love with his music in the first place. Lil Pookie’s first release in more than a decade not only represents the comeback of a former child prodigy but a renewed sense of vigor for a talented frontman. Though his band name is listed as the Zydeco Sensations, for all practical purposes, Pookie is the Sensations. He wrote all 15 songs, tracked all vocals and played all instruments—accordions, bass, keys, and drums—while temporarily living in the Bay Area. The only other contributor is producer Andre Thierry, an undisputed West Coast zydeco monster in his own right, who knocked out the searing guitar licks. The end result is a tight, modern zydeco record that’s 100% dance-oriented without the typical wannabe strays into rap, hip-hop, or contemporary R&B. Of course, these styles influence Pookie’s urban sound, but overall it’s still fresh enough that it’s obvious he invents within the framework (note the mesmerizing staccato patterns on “Find My Woman”), rather than chases the crowd. The pace is consistently aggressive but varies texturally with the alternating of punchy single-row and gliding triple-row accordions, the sprinkling of dancing keys (“Teddy’s Club”), club DJ voice overs, and different densities applied to the arrangements. A fashionable comeback to say the least. Youthful multi-instrumentalist Jimmy “Lil’ Pookie” Seraile was born into a talented musical family on the outskirts of Opelousas, Louisiana, in the tiny rural community of Frilot Cove. His grandfather was Delton Broussard, leader of the legendary Lawtell Playboys, while three of his uncles were founding members of the popular Zydeco Force band. In fact, Pookie began his musical career as a teenager playing the “frottoir,” or rubboard, and gaining valuable stage experience by touring extensively with the Flames. He also, early on, picked up other instruments (in addition to the rubboard he plays accordion, bass, guitar and drums here) and before long was the Flames’ accordionist. All the while, the observant Pookie was developing his own rhythm-oriented zydeco sound by adding elements of funk, rap, rock, R&B and reggae to affairs – taking the music of veterans like Boozoo Chavis, Beau Jocque and Roy Carrier (all of whom he also worked with) a step further. The only Sensation identified on this project is the album’s co-mixer Andre Thierry, who plays vibrant lead guitar on all 15 tracks and keyboards on the vivacious yet lovelorn saga “Stressing Me Out.” Other Pookie-authored gems, that undoubtedly have the dance floors packed, include his dynamic tribute to “Teddy’s Club,” a sensually swaggering “Kiss You Right There,” the autobiographical title song, a bluesy ode to modern technology called “I Call Your Phone” and the tradition-steeped instrumental “Pookie’s Waltz.” According to the liners, the talented Pookie has been away from the music scene for a while. This comeback release finds him still in the groove, and then some.